My dad is a vicar who has seen A LOT of wedding photographers over the years. Sometimes he can find them very distracting and as he was marrying us, as well as giving me away, we wanted someone who would blend into the background. 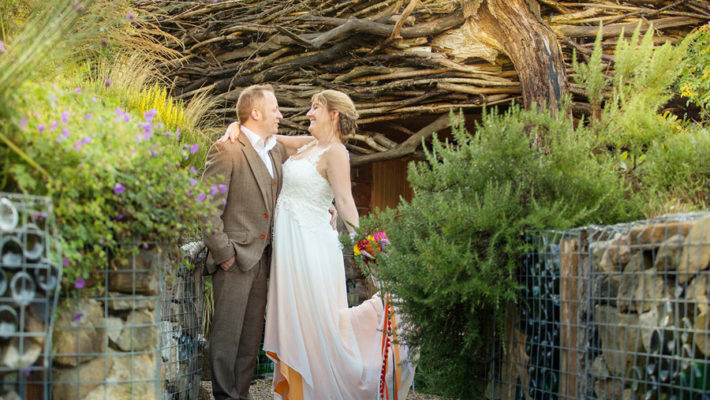 As it happened, Penny and Jim [Penny Young Photography] had recently shot a wedding at his church and he said they were the best he’d worked with, had a lovely gentle manner and didn’t get in the way as so many can do! Pretty much everything was homemade! As well as the stationery, cake and bouquets we had home-grown flowers and foliage on the tables that looked great in recycled jam jars with a bit of raffia. My mum baked heart-shaped shortbread biscuits for the favours that were wrapped in cellophane bags, tied with ribbon and a handwritten name label. We mainly got all the bits and bobs we needed from eBay. My artistic friend Hannah also wrote out the seating plan on an old wardrobe door that I’d found on a pavement and painted! Yes definitely! They were everything we wanted and they really put us at ease. They knew exactly where and when to get the right shots but were never bossy or pushy. We actually have very little memory of them being there despite the hundreds of beautiful photos to prove otherwise which just goes to show how discreet they were! We also really appreciated the time they spent with us before the wedding to get to know us and what was planned for the day. We got together with both sets of parents and our photographers played them to us in our home. It was very emotional to relive so many happy memories together. We also loved seeing new moments for the first time such as the other getting ready with their friends and family. Intimate, magical, relaxed togetherness thanks to family and friends. Rustic and homemade with pastel colours. We did lots of online research but as we weren’t local, we also benefited from the people in the area who offered their help and recommendations. Get as many friends and family and friends of friends involved! We had so much help from generous people, some of whom didn’t even know us! We borrowed all sorts including marquees, hay bales, bunting and lights. It made the day even more special knowing it was made possible by all the help we had received. However, don’t assume a do-it-yourself wedding is necessarily the cheaper option! We had to hire a lot of things that you normally take for granted (such as generators, toilets and furniture) and they need to account for a big part of your budget. Although being able to buy the wine from France and not having to pay corkage was a nice saving! One of our biggest expenditures was the 8-piece band (Pandora’s Jukebox) and they were worth every penny. They instantly filled the dance floor which stayed packed all night and they took the atmosphere to a whole new level! They covered a range of music from different decades and we got to pick lots of our favourites. They also learned our first dance for us which was an unforgettable moment. We also had an amazing caterer who was never phased by the large numbers, outdoor location and limited facilities. As well as the delicious 3-course food and canapés, she helped us source all the stuff we needed for the meal such as the equipment, furniture, crockery and service. It was definitely a labour of love! My mum designed and produced the save the dates, invitations and the order of service which involved a lot of printing, cutting and assembling! And she calligraphed everyone’s names for the invitations and place cards (all 170 of them!). Yes it was exactly what I was looking for (including a bargain!). I wanted something that would work well for all parts of the day from the church through to the dancing and I loved the lace detail. Despite this, close to the big day, I still started to worry it wasn’t going to be right but it was just nerves. After my bridesmaid Georgina made a few small alterations, it fitted so well and I wouldn’t have changed a thing. I spent a lot of time looking for shoes as I wanted comfortable ones that would stay in place as well as block heels so that I wouldn’t sink into the grass! They also had to be just the right height so that I didn’t need to alter the dress. Rainbow Club’s Betty Satin and Lace Strap Court Shoes were just the job – I didn’t take them off until it was time for bed! I borrowed the veil from my bridesmaid Fi which I loved and made me feel so bridal! I also ordered some personalised bracelets to wear so that when I wear them now, I have a memento of the day. Damian wanted a summery blue for his suit and we found just the right colour on a great value three-piece suit at Topman for him and the groomsmen. I really liked the idea of the girls being in different pastel shades. They picked out a dress that they liked on etsy which was made to order to their dimensions and to the colours we selected. I was nervous ordering from the States without them being able to try them on but they fitted really well. Just beware the custom fees on top! My bridesmaid recommended her hairdresser who was local and so we went to her salon on the day for hair and makeup. It was so much cheaper doing it this way as well as a really relaxing start to the day, segregated away from the preparations! We had the place to ourselves so we could spread out and have some food and prosecco! My mum did the church flowers and all the bouquets, and her friend helped her with the buttonholes and preparing flowers for the hairdresser to fix in my hair. I wanted a very natural look to fit with the rural setting and echo the colours of the bridesmaids’ dresses, and I particularly wanted the bouquets to include blue hydrangeas, which they did, mixed with roses and Gypsophila. The flowers on the tables were a joint effort by family and friends. Not really, the majority of time was spent on setting it up to be ready for guests such as putting up the marquees and laying out furniture. We loved it just as it was but we added some bunting and hung lots of fairy lights which looked beautiful at night. We made hessian drapes for the open barn to close at night against the breeze. We also cut strips of lace and calico to cover the open garage as a backdrop to where we had the top table. We just had to make sure we left enough space for the nesting swallows to fly in and out!! As my dad said in his speech: It was an emotional day, even the cake was in tiers! My mum made three different cakes all with matching frosting that tied in with the colour scheme. We chose our favourite flavours for each layer: lime and coconut; white chocolate and raspberry; and carrot cake. Each layer was amazing and having the personal touch of it being baked by my mum made it all the more special. My sister also made cupcakes with rose and hydrangea icing. We didn’t end up eating any on the day but took plenty with us on honeymoon! The band were so special and engaging. Nothing beats live music. The saxophonist and trumpet player came out into the crowd for one song and for another, they set up a men vs women sing-off which was fiercely contested! The best piece of advice we were given was “just enjoy it”. It sounds obvious but I spoke to a few brides who wished they could do it all again as they had been so stressed, they hadn’t enjoyed themselves. As a perfectionist, I knew I would have to let go and just go with the flow. I really wanted to be a guest at my wedding, not the host! I put my trust in others and it worked – everyone commented how relaxed I was and that I didn’t stop smiling. So just enjoy every moment and take some time out to try and take it all in. Apart from being able to look back on great memories with friends and family for years to come, we love that nothing has changed!